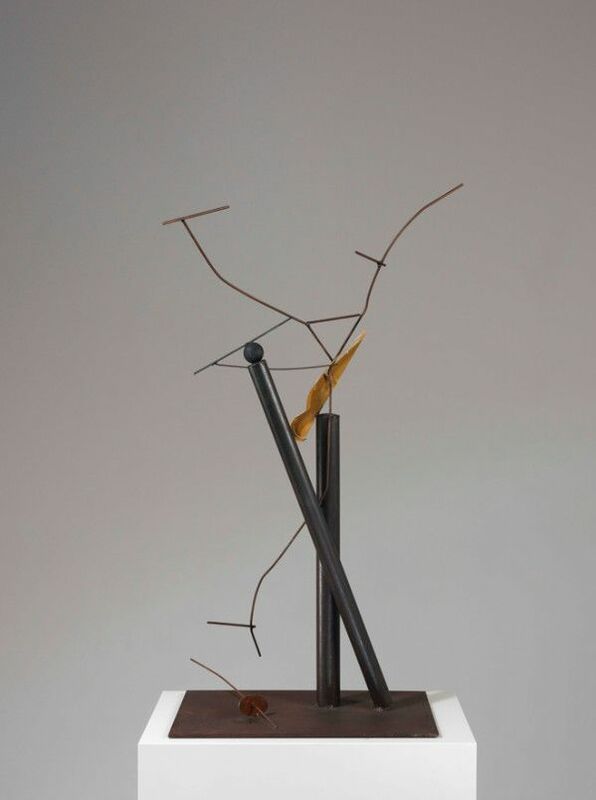 On occasion of the Berlin Art Week Galerie Michael Haas presents sculptures by Auke de Vries (*1937) at the gallery and the Kunst Lager Haas. The sculptures in the public space of Auke de Vries have become landmarks in cities such as Amsterdam, Barcelona, Hanover, Magdeburg, Ludwigsburg, and Wakefield in Yorkshire. This includes for instance the “Maasbeeld”, which inclines over the river Maas in the city of Rotterdam. His autonomous sculptures have been shown in manifold solo exhibitions in museums over the past 40 years, mainly in the Netherlands and Germany. On the occasion of the presentation in Berlin, the artist designs an outdoor sculpture especially for the Kunst Lager Haas. In addition, there is an overview of his plastic work of the last three decades, accompanied by design drawings. The sculptures made of steel often consist of simple elemental forms, ranging from smaller objects on a stand on the floor, or on the wall to meter-high installations. There are partly sensitive and unprecise, like tender, linear drawings in space, here absurd and humorous like Dada, there narrative and associative. The materials are not very noble, rather simple: mostly steel, often wire, individual pieces of cardboard, sheet metal or wood. In part, the steel is corroded by treatment with acid, the partial colourful painting is coarse, negligent, and some surfaces are painted in monochrome colours. One might think that the objects made of curved metal parts are made of cardboard or paper. However, their fragility and agility are mostly solely an appearance, especially in the monumental sculptures constructed of solid steel. De Vries began to paint as a self-taught artist and to work as a graphic designer in the mid-1950s. Already from 1957 he is significantly participating in exhibitions and individual shows in Europe, receiving in 1959 the Royal Prize for Painting. From the 1960s onwards he made paintings, drawings, and etchings. In 1969, he creates his first sculptures, quickly followed by the first public commission for sculptural designs. He becomes a professor at the Academy of Fine Arts in The Hague (1972-1986) and the Royal Academy of Visual Arts Amsterdam (1986-1996). A catalogue is being published.